Okay, so I have to admit, I am not the biggest fan of character birthdays but when your toddler LOVES Elmo (or other furry character), not much to do but go along with it! I didn’t want to do your standard party store Elmo party, so I opted for a bit more of a graphic version, utilizing red, orange and white & polka dots as my inspiration (along with Elmo of course!). 2. Eyes: I cut a large marshmallow in half and stuck them into the frosting. I used black frosting or gel for the pupils (NOT suggested), but it bled into the marshmallows overnight. I would opt for attaching a small black candy (junior mints, m&m, chocolate chip, etc.-none of those were options for me, due to my kiddos allergies!). 3. Nose: I used orange large gumdrops. You could also use orange gum balls. That’s about it! I only made a mouth on 1 (for the birthday boy), the red frosting was enough for me! I didn’t want red and black stains all over my house after a party full of 2 year olds had their way with the cupcakes. Elmo Pizzas: This is a fun and easy kid project. I used english muffins as the crust, topped with pizza sauce and used white and orange cheese circles for the eyes and nose (yes, those odd pre wrapped cheeses work great for these. Mine were soy, looked cute, not so yummy-sorry to all you vegans soy cheese is just not the same!). I imagine rounds of mozzarella (or other white cheese) and cheddar would work as well. For the pupil I used olives. You could add pepperoni bits/slices for the fur. Bake for a few minutes and they are done! Really super easy, cute and fun for the kids! Decor: I went with simple decor in bright red & orange. I added the Elmo face to numerous things throughout the party to carry our theme, cups, food containers, etc. I used dollar store sand pails and shovels to serve the food. It was fun for the kids and the buckets went to good use throughout the summer! 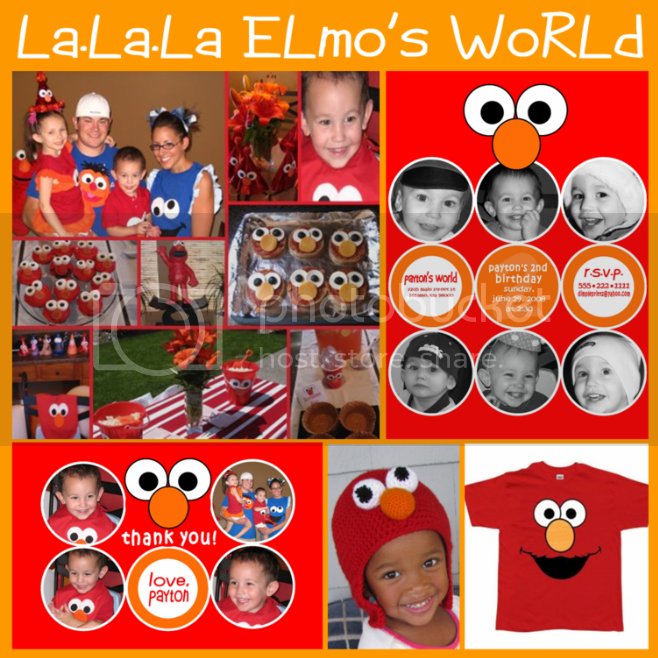 Outfit: There are lots of cute homemade Elmo hats, shirts & outfits available on Etsy. Instead of a party hat for the birthday boy or girl, how about this cute Elmo beanie by TizzyDee, at least they could get some good use of it after the party. I am kind of a do-it-yourselfer, so at the last minute I decided to make the whole family Sesame inspired shirts, not my be work by any means but at 2am the night before the party, what can you expect! WARNING: You may receive EVERY Elmo toy available (we did and then my son one day about 1.5 months later decided he wasn’t into Elmo any more!). Did you make the elmo invitations yourself? I looked at your etsy site, but I didn't see them on there. I am throwing an Elmo themed birthday party for my daughter in March, and I cannot find Elmo invitations that I like. Would you do a custom invitation like this one on etsy?